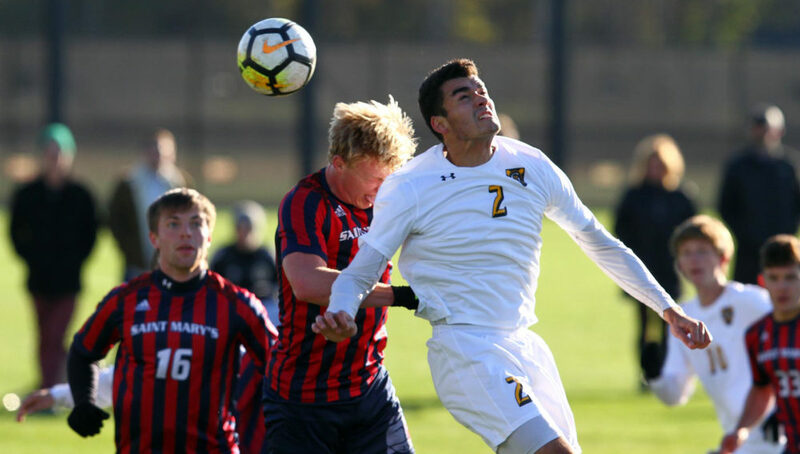 SAINT PETER, Minn. – The Gustavus men’s soccer team defeated the Cardinals of Saint Mary’s by a score of 4-1 on Monday afternoon. The Gusties’ unbeaten streak now improves to 10 games and their record improves to 11-1-1 overall and 7-0-1 in the conference while Saint Mary’s drops to 5-8-1 overall and 2-5 in the MIAC. The Gusties jumped out to a quick start when Arthur Parens (Sr., Wayzata, Minn.) scored his eighth goal of the season in the sixth minute with assists going to both Matt Gibbons (So., Minneapolis, Minn) and Trace Dobson (So., Sioux Falls, S.D.). The middle portion of the first half was an absolute battle from both teams as they played physical. In the 33rd minute, the Gusties took over when Gibbons took a throw in from the left sideline that went all the way into the box and Joe Brandel (Jr., St. Louis Park, Minn.) leaped through a few bodies and headed it over the goalkeeper for a Gustie score to gain a 2-0 lead. Just over a minute later, when the Cardinals were trying to clear a ball, Nolan Garvin (So., Batavia, Ill.) intercepted it and shot a laser from outside the box that found the back of the net to give the Gusties a 3-0 lead. The Cardinals scored a goal in the 35th minute to make the score 3-1 and that held until halftime. The Gusties came out strong again in the second half when Gibbons took a free kick in the 54th minute and put it in the top left corner of the net to give the Gusties a 4-1 edge. The rest of the game played scoreless as both Anders Severson (Sr., Woodbury, Minn.) and the Cardinal goalkeeper made some good saves to keep the ball from the back of the net. On the day, Severson had three saves and just the one goal allowed to improve his record to 9-0-1. In the contest, the Gusties outshot the Cardinals by a tally 24-14 and put 12 shots on goal compared to Saint Mary’s four. The Gusties will next be in action on Wednesday when they host Viterbo for a 4 p.m. contest.